This isn’t new information. You’ll be well aware of how important it is that your website reflects your company’s professionalism, expertise, and personality. And, of how important it is that buyers feel welcomed when they land on your site and inspired when they leave. But with technology moving at a rapid pace, you need to make sure your website continues to deliver the best possible experience for buyers. 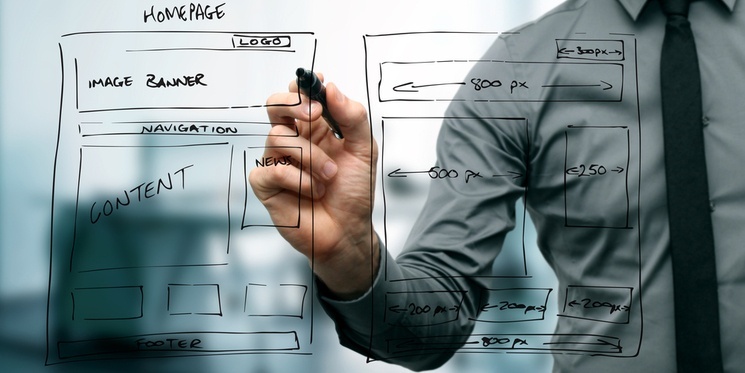 So if you're thinking about a website redesign for your professional services company, here are four things to consider that might just give you the spark you need to take action. Layout contributes enormously to the overall success of a website. A layout that is easy to follow will encourage your audience to explore and learn about your products. A layout that is chaotic, too busy and unwieldy will turn visitors off. Getting to know your website - and your company - will feel too much like hard work. Think about your navigation menu. Do your categories make sense to your prospects? Research by Nielson Norman Group reveals one of the biggest web design mistakes is having content in unexpected places. So when deciding which topics you want to include in your menu bar, look at it from the point of view of how buyers will think about content - not how your company thinks. By ordering your website in a way that makes sense to your prospects, you'll make it easy for them to locate what they're looking for. And how many categories do you have? In this context, less is more. Hinge suggest having no more than six top-level categories. You can always guide people to more specific subsets with drop-down menus. The rise of mobile web browsing is one reason many companies have moved to a card design in the last few years. And this is a trend that’s expected to continue in 2018. Think Pinterest; lots of ‘cards’ or boxes of content that make it easy for visitors to hone in on key information of interest and relevance to them. If you’re still creating pages with long paragraphs of dense text, this is one way to consider breaking them up. Images add another dimension to your website. They are great for capturing your audience's attention and keeping them engaged. But if you’re tired of using soulless stock photos, now’s the time to do something about it. Professional service companies are thinking more carefully about the images they use. They are increasingly switching their attention from stock imagery to original photography. By using a photographer to shoot images for your website, a shot can be framed to convey the exact vision you want. One that better matches your brand, message, and personality. Your website is your opportunity to bring your company to life for buyers seeking a solution like yours and to differentiate yourself from the competition. If you’re not already doing so, consider outlining your core proposition on your homepage. This could simply be one or two sentences that sum up your business in clear, accessible language. So, what is your why? Share it on your website. But, keep it simple, concise and accessible to keep your audience engaged. More and more professional services companies are adding a blog to their website. For good reason - it’s one of the most valuable assets your website can have. Through blogging, you can demonstrate your expertise, address the questions and problems of your prospects, and display your personality. A blog can help drive traffic to your site through keywords and inbound links. And it keeps on giving. One single blog post has the potential to drive traffic to your website for weeks, months, and even years. With the vast majority of buyers carrying out in-depth research online before making a purchase, if you don’t have a blog to convince them that your company will provide the solution they need, then you’re missing out on a brilliant opportunity to attract and engage the customers you’re looking for. Unsure of whether your website is hitting the right mark? Why not test it? Reaching out to customers and prospects to get their feedback on your website can be a really valuable first step in your website redesign process. First impressions count. And as the first interaction you’ll have with prospective buyers, your website needs to make the right one. An outdated, cluttered, or lacklustre website can dramatically decrease your chances of convincing buyers to choose you. With just a few changes, you can transform your website into one that will generate the traffic, leads and customers you seek.